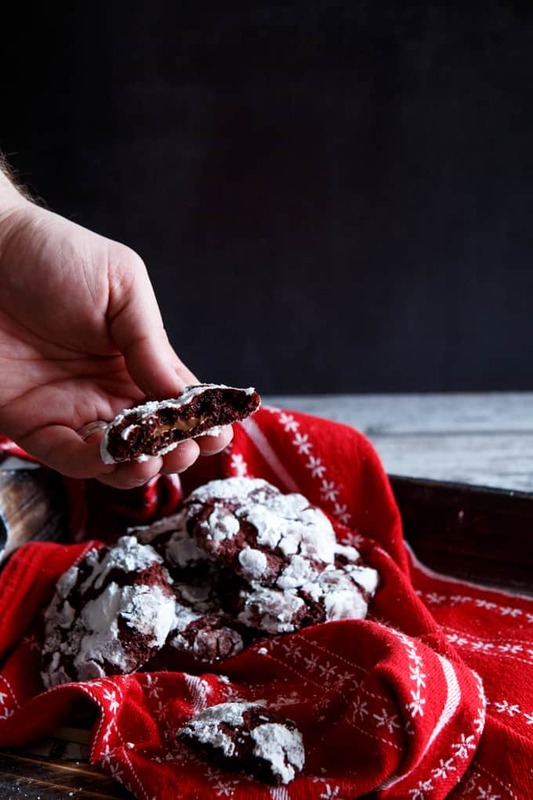 You might just get on Santa’s good list this year if you leave him some of these Nutella Stuffed Red Velvet Chocolate Chip Cookies. 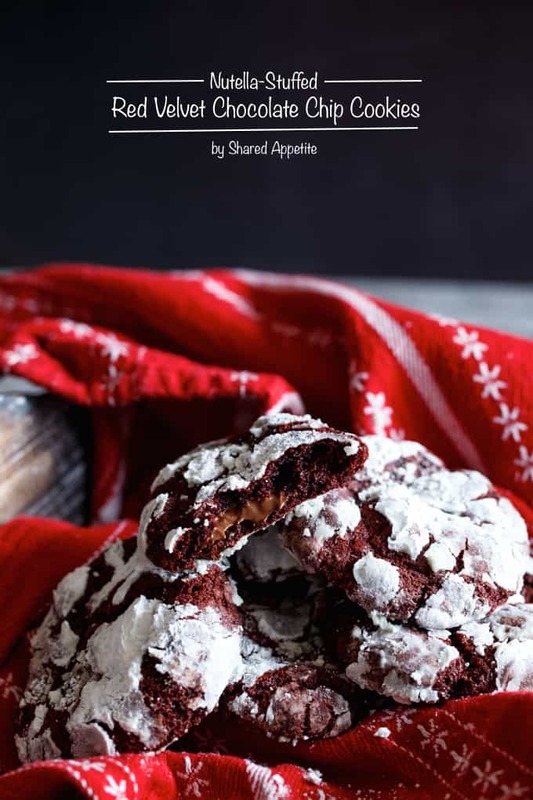 Before we get into these Nutella Stuffed Red Velvet Chocolate Chip Cookies (Ermagherd they are so good…), I need to give a big thank you shout-out to Lisa over at Garlic and Zest. She spotlights fellow food bloggers and featured me in an interview a couple weeks back. Check it out! And thanks Lisa! So… Christmas is just a few days away. Who’s ready? Who’s still shopping? ::ahem:: Who hasn’t even starting shopping yet? I’m super pumped about this Christmas. It’s the first time ever we will be hosting a holiday. We just moved into our forever house this past summer (it better be our forever house, since Asheley has sworn she is never moving again), and it’s so perfect for entertaining. Which, of course, is the whole reason why we fell in love with it in the first place. I have to admit, this year was majorly lame in the outdoor decorating department. We didn’t put up any Christmas lights on the house… so yea, we are that house on our block. Everyone else has Clark Griswald-approved displays and we have… a little red bow on the front door. But there’s a method to my madness. I figure, hey, it’s our first year in this house. The neighbors will understand why we don’t have any decorations up on the outside. Because, really, who wants to pay full price (and by full price, I mean way overpriced) for all that seasonal Christmas stuff. But then boom, the day after Christmas, I’m hitting up all those crazy sales and buying a ridiculous amount of crap for next year. Inside is a different story. The tree is up. Asheley snagged a free poinsettia plant from work. And the kitchen is full of cookies. Like these Compost Cookies. And Cookie Butter Stuffed Brown Butter + Sea Salt Chocolate Chip Cookies. And Chocolate Orange Truffle Crinkle Cookies. And Red Velvet Peppermint Chocolate Chip Cookies. 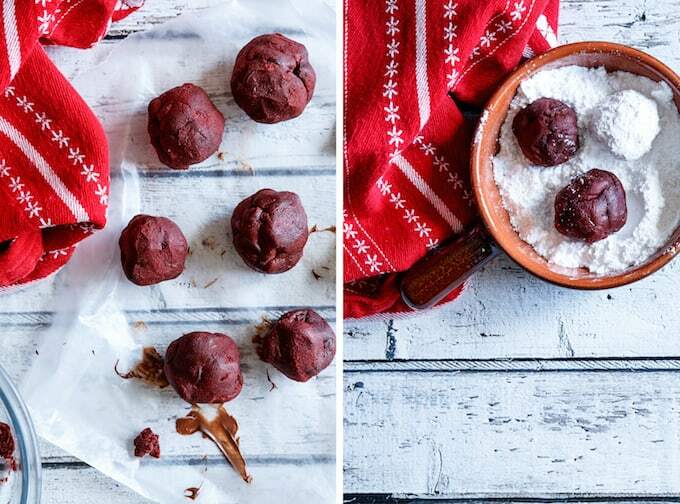 And now… these Nutella Stuffed Red Velvet Chocolate Chip Cookies. Kids, listen up. If you want to snag some extra presents from Santa this year… leave him a bunch these creative Christmas cookies. He’s a fan. Using a small spoon, drop approximately 20-24 little dollops of nutella (about 1/2-1 teaspoon each) onto a wax paper lined plate. Place in freezer and allow to firm up. Combine flour, cocoa powder, baking soda, and Kosher salt in a small bowl; set aside. In the bowl of your stand mixer or in a medium mixing bowl fitted with an electric mixer, beat the butter, brown sugar, and granulated sugar until well combined. Scrape down sides of bowl and beat in egg and vanilla extract. On low speed, add in red food coloring, scraping down sides as necessary. Slowly add in dry ingredients on low speed and mix until just combined. Add chocolate chips and stir until combined. Place plastic wrap directly onto dough to tightly cover and chill in refrigerator for at least 1 hour or up to a few days. When ready to bake, preheat oven to 375°F. Remove Nutella from freezer and cookie dough from refrigerator. 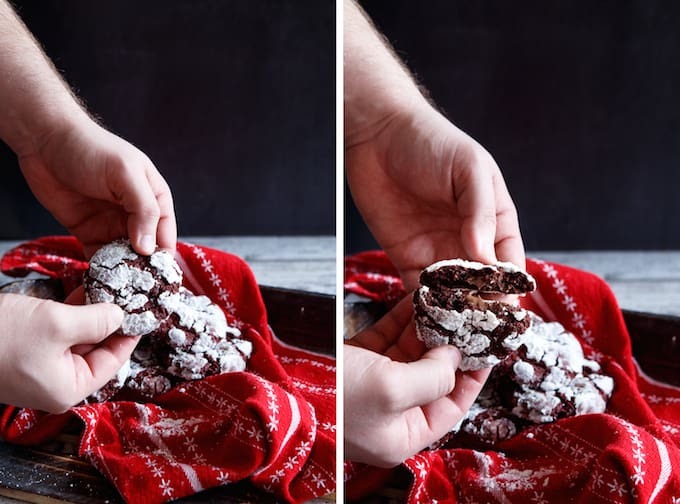 Take a spoonful of cookie dough, flatten it pretty thin between the palms of your hands, place a frozen Nutella nugget in the center, and form the dough around to completely enclose the Nutella. Roll dough into a ball. Repeat. If desired, place powdered sugar in a small bowl. Coat very generously in the powdered sugar. This is not required and purely if you want that crinkle appearance. Place on baking sheets and bake approximately 8-9 minutes. Remove from oven and let cool on baking tray for a few minutes to set. Transfer to a cooling rack to cool completely. Best when served warm. I’m totally ready for Christmas and the kitchen is also FULL of cookies. BUT, UMM, not THESE COOKIES! I am totally coming over because these look INCREDIBLE. Pinned! Hahaha anytime you want to come to NY, you have a place to stay! You have a truly twisted mind – for which I am jealous. How did you come up with this combo??? I am digging that nutella center! These cookies are simply fabulous. I totally want to eat them all. Thanks Jen! Yea, that nutella action is where it’s at! Thanks Jess! Glad you share my enthusiasm for Nutella!! Ahhh stoppp. This is possibly the only way red velvet could get any better than it already is. I need these immediately!! Haha thanks Beth! I know.. red velvet is a fave of mine 🙂 Merry Christmas! Haha the neighbors would totally understand about the decorations, especially if you showed them these cookies! They look absolutely incredible!!! Red velvet and a Nutella stuffing??? **Drool!!! Enjoy your first Christmas in your new home and Merry merry Christmas to you and Asheley!!! That’s a great idea… bribing with cookies always works!! Merry Christmas to you and your family Kelly! Oh my GAWD!!! These exist?? Forget Santa, I will be making these for myself and NOT sharing!! Enjoy the first Christmas in your new house 🙂 Merry Christmas!! Hahahaha now that’s what I’m talking about Zainab! Screw Santa… Zainab is coming to town (for cookies). Merry Christmas to you and yours! haha yeah, it took us some time to get christmas decorations for outside – we always buy decorations right after christmas for the following year! 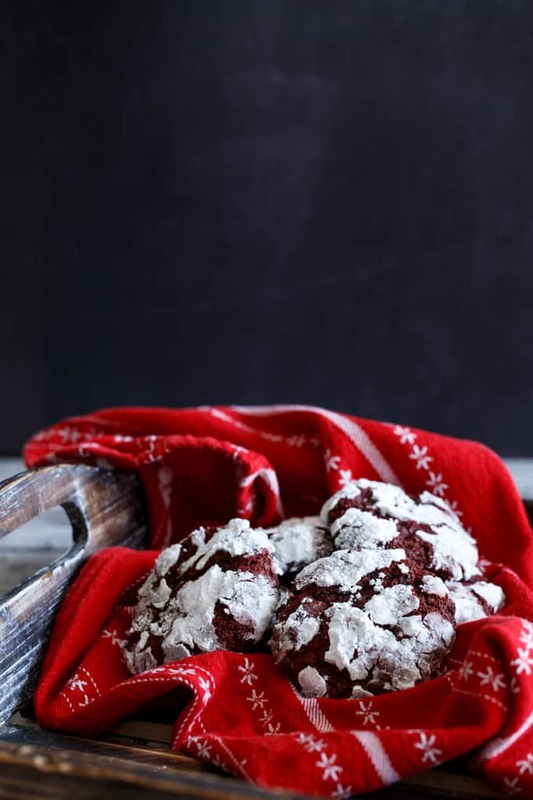 And these cookies look awesome – red velvet for the win! I figured the neighbors would understand the process hahaha. I’m gonna be raiding Target the day after Christmas!!! Merry Christmas to you and yours Ashley! 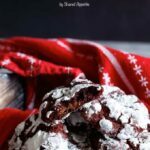 My kitchen is full of cookies, too, but there might be room for one more…as your Nutella filled red velvet cookies sound amazing!! Merry Christmas!!! Hahaha there’s always room for one more cookie! Merry Christmas to you and your family Liz! These cookies…yes yes yes! As if red velvet couldn’t get better, you go on putting Nutella inside? Genius!! Love these, Chris! These cookies look like dreams come true! Just in time for the holidays. Be careful, people pretending to be Santa might try to come over to your house just for these cookies 🙂 happy holidays! Hahahaha very true… I’ll be on the look out for imposters! That is one radical cookie! Pure genius. Have a wonderful Christmas Chris! Thanks Melanie! Merry Christmas to you and your family! Oh boy! These have my name written all over them! I’m a sucker for all things nutella! Nutella and red velvet? Oh MY. I’ve never thought to put those two things together, and I love them both! Love these cookies! Nutella – I have never had it before in my life! Can you believe it!!! ha! These look addicting FOR SURE!!!! What an amazing idea! I saw these on Pinterest and could barely believe they were real 🙂 Too good! Merry Christmas! 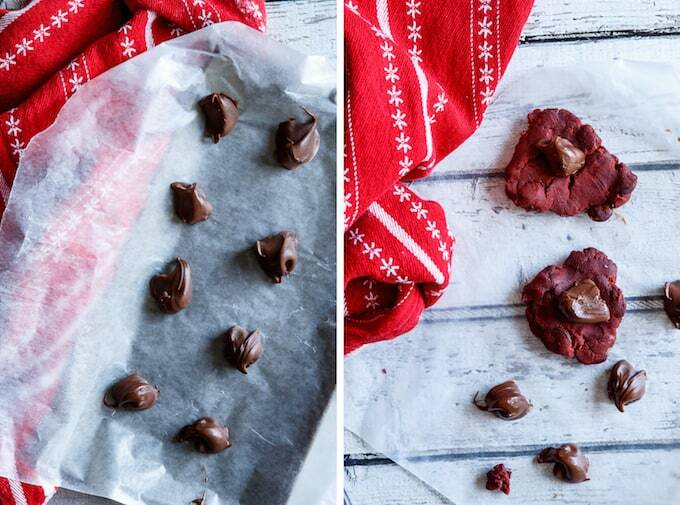 Christmas may be over but I still definitely want these cookies in my kitchen! I’ll need extra Nutella dollops for me. I hope you and the Mrs had a lovely Christmas! I wish you both a happy and healthy 2015!! These cookies look incredible – Santa was definitely very happy at your house!! I hope you two had an amazing Christmas. And congrats on your great news – so exciting!